Combine mint leave and half the lime slices (reserve the other half) in the bottom of a pitcher. Use a muddler (or wooden spoon) to press the ingredients into the bottom and sides of the pitcher so that the mint leaves are crushed and the limes release their juice. 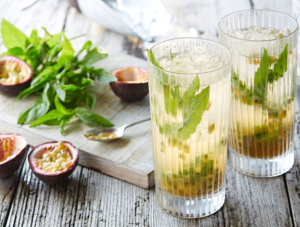 Pour the passion fruit pulp, apple juice, ice and soda water over top and stir gently to combine. When ready to serve, divide the mojitos between glasses and top with the remaining half of the limes slices and some extra mint leaves. *The passion fruit can be easily substituted in this recipe for other delicious fruit pulps, including mango and pineapple.